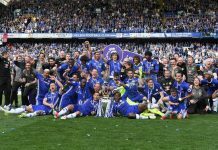 If, at the start of the season, it was suggested to you that Nana Ofori-Twumasi was the most likely Chelsea player to be lifting silverware come the end of the season, you’d probably have laughed it off. However, after the unfortunate 1-1 draw with Wigan and with a typical Champions League Semi Final with Liverpool on the horizon, this Wednesday represents a very real chance for Chelsea’s only trophy success of the campaign.It won’t be easy though. Much like the Semi Final tie against Aston Villa, Paul Clement’s boys travel north for a second leg at a Premiership ground after a 1-1 draw at Stamford Bridge. The City of Manchester Stadium is the venue, Manchester City the opposition, and the biggest 90 minutes in the careers of those in blue. There was a sense of disappointment at full time at Stamford Bridge a fortnight ago. The visitors had their chances and took the lead, but Chelsea really pressed on for the last third of the game and on another day could have gone into this week’s return leg with a healthy advantage. Morten Nielsen and Sergio Tejera had goals disallowed, Tejera also hit the post, and numerous other players went close to finding the net. As it was, only Gael Kakuta could, rising brilliantly to meet Miroslav Stoch’s corner at the near post. That isn’t to say that Man City were poor or aren’t a threat. They deserved their lead and should have had more. Captain Ben Mee drew a world-class save from Rhys Taylor, as did Vladimir Weiss, and David Ball skied a chance into the Shed End Upper when it was much easier to score. They pose a real danger and as the competition’s leading scorers are entirely capable of putting the match to bed early. A lot rests on the fitness of Daniel Sturridge. The 17 year-old hitman scored their goal in the first leg and was at the middle of a contentious penalty decision for the full team at Sunderland last weekend before limping off injured. It will be touch and go as to whether he makes it, but he’d be a massive loss if he were to miss out. Chelsea have no such injury worries, resting up key names as much as possible. The full team had a run-out against Ipswich last week, winning a mad game 6-4, with Miroslav Stoch scoring four in the first half. The majority of the team then sat it out at the weekend, but Ofori-Twumasi, Gordon and Mellis featured in a 2-2 draw with Cardiff, Mellis scoring both goals. Man City have been in impressive form, recording comprehensive wins over Sheffield Wednesday and Nottingham Forest, and they are going all out to win the Cup for the first time in 22 years. Their barren spell isn’t quite Chelsea’s 47 years, but manager Jim Cassell is desperate to win a competition their academy targets year in and year out. Two years ago they fell to Liverpool in the Final with a team featuring five players who have gone on to make notable Premiership appearances, including Micah Richards. Rhys Taylor, Nana Ofori-Twumasi ©, Jeffrey Bruma, Patrick van Aanholt, Ben Gordon, Michael Woods, Sergio Tejera, Jacob Mellis, Gael Kakuta, Miroslav Stoch, Morten Nielsen. FA Youth Cup super-sub Adam Phillip will no doubt have another integral part to play, as he has throughout the run. The game at Eastlands kicks off at 7.45pm, with entry to the ground costing £5 for any local Chelsea fans wishing to go along and cheer the youngsters onto glory. The game is also shown LIVE on Sky Sports 1 and HD1 from 7.30pm. A full report will follow on CFCnet.